Light and refreshing soup, perfect for a warm summer evening. Make corn stock – Put 7 corncobs (kernels removed and set aside), 4 peppercorns, 2 stems fresh parsley, 2 sprigs fresh thyme, 1 bay leaf, and 6 cups cold water in a large pot and bring to a boil over high heat. Reduce heat to medium and simmer for 2 hours. Strain, discard solids, and set aside. Heat 1 cup of corn stock in a large saucepan over medium-high heat. Add onions, thyme, and 1 teaspoon salt. Reduce heat to medium-low, cover and cook 8 minutes or until onion is softened, stirring frequently. Add corn (set ½ cup aside for garnish) and garlic, cover and cook 4 minutes. Then add 3 cups corn stock, coconut milk, and 1 teaspoon of salt. Increase heat to bring to a boil, then remove from heat; discard thyme. Place half of corn mixture in a blender. Secure blender lid on blender, but allow steam to escape. Place a clean towel over opening in blender lid (to avoid splatters). Blend until smooth. Strain corn mixture through a sieve into a large bowl; discard solids. Repeat procedure with remaining corn mixture. Chill at least 4 hours. With extra corn kernels, place under high broiler until lightly charred. 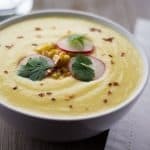 Top soup with roasted corn, radish, cilantro, and red pepper flakes. Enjoy!